The tourism industry constitutes a significant portion of the Taiwanese economy. In 2015, Taiwan attracted 10.44 million tourists and generated US$14.39 billion in revenue, which totaled 4% of the same year’s GDP. Since the establishment of direct, non-chartered cross-Strait flights in April 2009, Chinese have made up approximately 40% of tourists in Taiwan. In fact, Chinese tourists in 2015 outnumbered the combined number of tourists from Japan, Hong Kong, South Korea, and the US. It goes without saying that Chinese tourists are vital to the health and success of Taiwan’s tourism sector. Aside from the sheer size of China’s population, several factors explain the massive influx of Chinese tourists into Taiwan. China and Taiwan’s close geographic and cultural ties play an important role in attracting Chinese tourists to Taiwan. Located just 110 miles off the coast of southeastern China, Taiwan is viewed by many as a guardian of traditional Chinese culture. After falling to Communist forces in 1949, the Kuomintang fled to Taiwan and brought with them thousands of historical relics. The dominant political party also encouraged citizens to embrace a Chinese identity in order to legitimize claims of representing the one true China in the world. Meanwhile in China, the Chinese Communist Party under Mao Zedong cracked down on “the four Olds” (si jiu四旧) – Old Customs, Old Culture, Old Habits, and Old Ideas – during the Cultural Revolution from 1966 to 1976. The massive sociopolitical movement wreaked a tremendous amount of damage on the country, its populace, and its culture. Today, Mainland Chinese tourists travel to Taiwan to observe divergences in Chinese and Taiwanese culture and politics. Whether it is Taiwan’s democratic system and all of its trappings – from campaign advertisements to opinionated and vocal taxi drivers – or marveling at the bustling activity surrounding Confucian temples, Chinese tourists frequently marvel at the myriad of differences between China and Taiwan. A second factor contributing to large numbers of Chinese tourists traveling to Taiwan is China’s growing middle class and steadily increasing disposable income per capita. Following Deng Xiaoping’s launch of Opening and Reform (gaige kaifang改革开放) in 1978, the Chinese economy experienced exponential growth and full-scale industrial development. A growing middle class with more money to spend on travel and leisure has emerged as China continues to reap the benefits of gaige kaifang and transition from an industrial economy to a service-based economy. Given the cultural and geographic proximity of Taiwan and China, it is no surprise that many Chinese choose to spend their vacation time and money traveling to Taiwan. Finally, improved economic cooperation between China and Taiwan and changes in the Taiwanese domestic political landscape facilitated the proper conditions for increased cross-Strait tourism. Prior to 2009, Chinese and Taiwanese citizens hoping to travel across the strait had to fly on chartered flights rather than on commercially scheduled flights. However, an agreement in April 2009 allowed airlines to schedule regular, direct flights, and thus more than doubled the previous number of flights traversing the strait. This agreement was made possible in part due to increased amounts of investment and trade between China and Taiwan, culminating in 2008 with the Economic Cooperation Framework Agreement. The timing of the cross-Strait travel agreement reflects the political dimension. Cross-Strait relations warmed up following the election of KMT candidate Ma Ying-jeou as Taiwanese president in 2008. The Chinese government favors the KMT because of the party’s long-term goal of unification, as opposed to the Democratic Progressive Party, which advocates de jure independence from China, nationalist Taiwanese identity, and higher military expenditures. China and Taiwan’s cultural and geographic closeness, China’s economic growth, and changes in the economic and political environments on both sides of the strait resulted in a steadily increasing number of Chinese tourists visiting Taiwan. The natural outcome of this trend is the Taiwanese tourist industry’s heavy reliance upon Chinese tourists to fill up their hotels, restaurants, tour groups, and tour buses. Therein lies the cause of September’s protests. The number of Chinese tourists visiting Taiwan has flagged considerably since the election of Tsai Ing-Wen, the head of Taiwan’s pro-independence Democratic Progressive Party, as President of Taiwan. In May and June, Taiwan saw a 12% decrease in Chinese tourist arrivals compared to 2015, and a 15% decrease in July. According to Taiwan’s Mainland Affairs Council, Chinese tourist arrivals have decreased by 22.3%, a devastating blow to one of Taiwan’s most important industries. Taiwan hoped to see an uptick in tourist arrivals during the National Day and Mid-Autumn Festival holidays, but those expectations were dashed when tourist arrival numbers remained low. However, the decreased number of Chinese tourists visiting Taiwan is not the result of an economic slowdown in China or some natural disaster that struck Taiwan. Instead, the Chinese government reportedly lowered the maximum allowance for Mainlanders traveling to Taiwan following Tsai’s election – from 16,000 a day to 10,000 a day – to place pressure on Taiwanese President Tsai Ing-Wen. Understanding the 1992 Consensus is important in understanding why the Chinese government wants to pressure Tsai. The 1992 Consensus was the product of a meeting between Gu Zhenfu (辜振甫) and Wang Daohan (汪道涵), the heads of SEF (Taiwan’s Straights Exchange Foundation) and ARATS (China’s Association for Relations Across the Taiwan Straits), respectively. Gu and Wang both sought to establish a political foundation for future cross-Strait interactions, but could not agree as to whether the “One-Country, Two-Systems” formulation – wherein Taiwan would agree that China and Taiwan are one country but each constitute a different “system” – should be built into this framework. In order to hold their respective positions on the matter, Gu and Wang verbally expressed their views in a purposefully ambiguous manner. ARATS put forth the following statement: “Both sides of the Taiwan Strait uphold that One-China principle and strive to seek national reunification. However, in routine cross-Strait consultations, the political meaning of “One China” will not be touched upon.” SEF responded: “Although the two sides uphold the one-China principle in the process of striving for cross-strait national reunification, each side has its own understanding of the meaning of one-China.” This sly way of saying “let’s agree to disagree, and move on” allowed the PRC and ROC to engage in increasingly frequent and meaningful interactions throughout the next couple of decades, culminating in a 2005 meeting between Chinese President Hu Jintao and Lien Chen, a 2008 meeting between Hu and Taiwanese President Ma Ying-Jeou, and a 2012 meeting between Chinese President Xi Jinping and Ma. However, President Tsai’s adherence to the DPP’s pro-independence line and refusal to accept the 1992 Consensus has frustrated China, and high-level official talks have not occurred since Tsai’s inauguration in May. In China’s eyes, using the 1992 Consensus as a political foundation for cross-Strait relations allowed both sides of the Taiwan Strait to meet each other halfway; the 1992 Consensus does not require China or Taiwan to explicitly state their positions about whether the PRC or ROC is the sole legitimate government of China. However, Tsai and the DPP are not concerned about governing China, and their repudiation of the 1992 Consensus has prompted China to apply pressure on Tsai from within Taiwan. 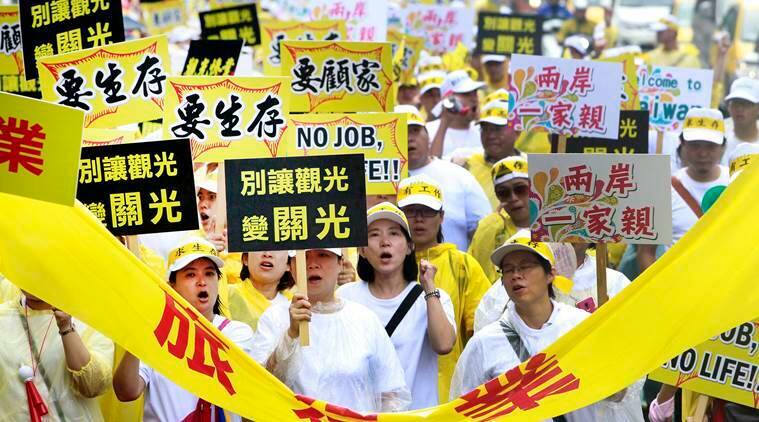 This brings us back to the thousands of Taiwanese tourism workers protesting in the rain. The Chinese government’s restriction on tourism has significantly damaged Taiwan’s tourism sector, despite Tsai’s government infusing US$1.3 billion into the struggling industry. Moving forward, the Chinese government will likely take advantage of Taiwan’s strong economic dependence on China to turn Taiwanese voters away from the DPP. Taiwan’s reliance upon China extends far beyond its tourism industry; China has been Taiwan’s top export market since 1999, and China became Taiwan’s leading source of exports (US$48 billion, or 18% of total Taiwanese exports) in 2014. Nearly seven months have passed without any indication of cross-Strait relations warming back up to pre-election levels. China’s decision to limit the number tourists traveling to Taiwan – or as some posit, allowing tourist numbers to regress down to normal levels by no longer encouraging Chinese citizens to travel to Taiwan – demonstrates that it is not willing to resume talks until the DPP accepts the 1992 Consensus. Instead, China will focus on cultivating ill-will towards the DPP in the hearts of Taiwanese voters. China’s plan to withhold economic benefits previously offered to Taiwan during KMT administrations may very well backfire if it stirs up civic nationalist, anti-China sentiment among the Taiwanese. But with Taiwan’s tourism industry badly hurting and Tsai’s approval rating sinking from 70% in May to 44% in late September, China may be content to wait until the 2020 general election and hope that the Taiwanese vote with their wallets.